TOKYO, May 15, 2017 - (JCN Newswire) - Kawasaki Geological Engineering Co., Ltd., Fujitsu Limited, and Fujitsu Traffic & Road Data Service Limited today announced that Kawasaki Geological Engineering has leveraged Fujitsu's AI engine to develop subsurface cavity survey technology. Being able to more accurately detect underground cavities that can cause sinkholes in roads, this technology will be made available as a service beginning in the summer of 2017. Kawasaki Geological Engineering is using FUJITSU Cloud Service K5 Zinrai Platform Service Zinrai Deep Learning--Fujitsu's deep learning platform service--to analyze and process the huge volume of radar images collected with underground radar probe equipment. This increases the efficiency of the search for underground cavities, which previously required expert technicians to make visual determinations. In addition, by connecting this technology with a service which displays the problem spots on a map--provided by Fujitsu Traffic & Road Data Service--the positions of cavities beneath road surfaces can be accurately understood, making the necessity of road repairs clear to local governments. In Japan, there are about 3,300 incidents of collapse caused by cavities under the surface of roads annually, making an issue in society. The primary cause of these collapses is aging sewer pipes, often located about three meters underground. This creates a growing need for a system that can determine the risk of a collapse without excavating the road to investigate. Currently, using underground radar probe equipment developed by Kawasaki Geological Engineering, underground surveys, which were previously limited to about one meter, can now be done to about five meters deep, which is expected to significantly improve the reliability of cavity explorations beneath road surfaces going forward. Because the massive volume of image data collected by the underground radar probe equipment must be visually evaluated by well-practiced expert technicians, however, there have been issues with preserving objectivity and ever increasing workloads. 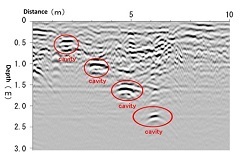 Analysis and processing of the massive volume of radar images taken with Kawasaki Geological Engineering's world-leading underground cavity detection technology will be carried out using image recognition through the Zinrai Deep Learning platform service, which was launched by Fujitsu in April 2017. The AI will be trained through machine learning on images where changes in radar reflection are displayed as waveforms, and will then determine whether they are cavities or sewer pipes. 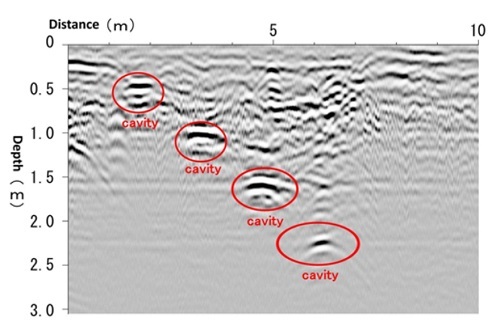 In a trial of cavity identification, in comparison with existing visual identification by expert technicians, not only was the cavity identification using AI able to accurately determine cavities from image data, it did the analysis in one-tenth of the time. 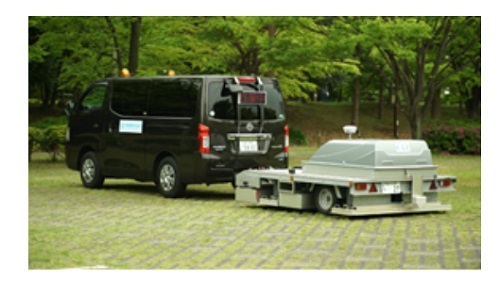 Going forward, Kawasaki Geological Engineering will link its AI-based subsurface cavity detection with unified services visualizing investigated locations provided by Fujitsu Traffic & Road Data Service, as well as continue to shrink and lighten its underground radar probe equipment, with the goal of commercializing it as a service that can broadly automate measurement tasks for organizations such as local governments, supporting more efficient road maintenance management. In addition, Kawasaki Geological Engineering will work to expand its cutting-edge subsurface cavity identification technology around the globe, beyond just Japan, to help prevent road collapses which are becoming an issue in society.